Votes enable users to indicate whether they found a question or answer helpful, and to build user reputation. Up vote useful questions and answers, down vote the ones that are not helpful. -2 points each time your question or answer is down voted. You're not awarded points for answering or up voting your own questions! Users can track their reputation on the Experts leader board. This is a great way to motivate users to answer questions and build a great community. 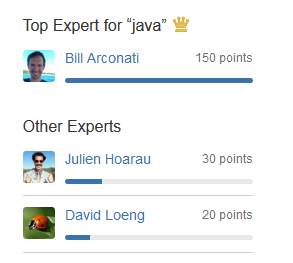 The leader board recognizes the top experts for the current week, and the top experts of all time. There's also a leader board for each topic, to recognize experts in specific fields.